Furthermore, Dr. Azizzadeh most commonly performs what he calls “buccal space modification” in combination with other facial rejuvenation procedures to help reshape the face to it’s more youthful contours. When evaluating a patient’s face, Dr. Azizzadeh’s philosophy is that the goal of facial rejuvenation surgery should be to create soft transitions between the different subunits of the face (upper face, mid-face, lower face). This approach often involves refining the appearance of the buccal fat pads if they are excessively convex so that this soft transition can be achieved. Cheek reduction surgery helps an individual improve not only the appearance of the cheeks, but brings harmony to the overall facial shape. For patients with overly full, round or chubby cheeks, removing the buccal fat pads results in a more sculpted and symmetrical facial appearance. The procedure is performed from inside of the mouth and does not result in visible scars on the face. Dr. Azizzadeh will strategically remove the correct amount of the buccal fat pad to enhance the patient’s youthful contours and overall facial shape. Addressing the buccal fat pad is extremely important in Dr. Azizzadeh’s approach to facial rejuvenation to create the most attractive facial appearance. Is Buccal Fat Pad Removal Different from Buccal Fat Pad Reduction? Both buccal fat pad removal and reduction procedures involve the removal of excess fat pads from the cheeks. During these procedures, Dr. Azizzadeh eliminates excess fat pads from the cheeks, resulting in a balanced, youthful-looking facial appearance. Buccal fat pad removal and reduction must be performed by a highly specialized facial plastic and reconstructive surgeon. Dr. Azizzadeh is a top-rated facial plastic and reconstructive surgeon who understands the complexities of cheek fat removal and reduction procedures. He performs a patient evaluation to determine if an individual qualifies for buccal fat pad removal or reduction surgery. If Dr. Azizzadeh believes buccal fat pad removal or reduction can help a patient achieve facial harmony, he next creates a custom treatment plan for him or her. During a consultation with Dr. Babak Azizzadeh , a globally recognized facial plastic and reconstructive surgeon, he will evaluate the patient’s face and listen to their plastic surgery goals. Together, Dr. Azizzadeh and the patient will come up with the best surgical plan to help them achieve their desired facial rejuvenation results. who have received setback mandibuloplasty surgery to reduce the size of the chin or jaw. This procedure helps shorten the jaw, but it can compress the mid-face tissues, causing chubby or puffy cheeks to form. who want to rejuvenate the overall appearance of their face. Before buccal space modification surgery is performed, Dr. Azizzadeh will offer full details about the benefits of buccal fat pad removal surgery, the procedure itself and recovery after treatment. He will also respond to a patient’s concerns and questions to help make an informed treatment decision. Facial Appearance: Buccal fat pad removal contours the cheeks, but an individual’s cheek size is not always related to his or her buccal pads. In certain instances, an individual’s cheek size is the result of fat deposits or over-developed muscle in the jaw. Recovery Time: Downtime after buccal fat pad removal is usually minimal, but it generally takes at least a few months before a patient sees the full results of treatment. Dr. Azizzadeh helps each of his patients plan ahead for all aspects of a buccal fat pad removal procedure. In addition to explaining how buccal fat pad removal is performed prior to surgery, Dr. Azizzadeh offers postoperative treatment instructions. He also requests follow-up visits after a buccal fat pad removal procedure to ensure a patient’s recovery stays on track. Dr. Azizzadeh performs buccal fat pad removal at an outpatient surgical facility and patients can return home the same day to start the recovery process. The procedure itself takes approximately 30 – 60 minutes to perform, but when combined with other facial rejuvenation procedures, the overall surgery time is much longer. Buccal fat pad removal is performed from inside the mouth in the cheek area. Dr. Azizzadeh gently removes the buccal fat pad, resulting in a more sculpted and natural-looking facial appearance without any visible scars. A buccal lipectomy patient may experience facial swelling following surgery. However, the swelling will dissipate on its own within about two to three weeks. After the swelling stops, the cheeks will start to look thinner and more contoured. It generally takes about seven to 10 days for the tissues inside the mouth to recover following buccal fat pad removal. As such, a patient may need to maintain a soft or semi-liquid diet in the first few days after surgery. What Are the Long-Term Results of Buccal Fat Pad Removal? The final results of buccal fat pad removal usually become visible several months after surgery once all of the swelling has subsided. 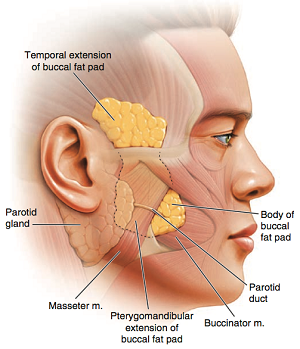 However, buccal fat pad removal results vary based on a patient’s diet and other factors. In some instances, weight gain or weight loss after buccal fat pad removal impacts treatment results. The natural aging process also causes facial wrinkles, sagging skin and other skin issues that may affect buccal fat pad removal results. Dr. Azizzadeh wants buccal fat pad removal patients to establish realistic treatment expectations. Prior to a buccal fat pad removal procedure, Dr. Azizzadeh teaches each of his patients about the surgery and its long-term results. Dr. Azizzadeh is available to respond to a buccal fat pad removal patient’s concerns or questions following treatment, too. Dr. Azizzadeh recognizes that no two facial surgery patients are exactly alike, and as a result, takes a personalized approach to cheek fat removal. Prior to cheek reduction surgery, Dr. Azizzadeh will meet with a patient, perform an extensive evaluation and learn about an individual’s treatment goals. Facelift: With a facelift, an individual can rejuvenate the facial appearance. Blepharoplasty: To ensure an overall rejuvenated appearance, blepharoplasty will lift drooping upper eyelids or erase under eye bags. Mid-Facelift: A mid-facelift is designed to address visible signs of aging in the lower eyelids and cheeks. Neck Lift: The neck lift will address the lower portion of the face including the jowls and neck. Chin Augmentation: Commonly referred to as mentoplasty, chin augmentation involves the placement of a small implant in the front of the chin bone to create a more balanced appearance. Dr. Azizzadeh conducts a patient evaluation before he performs buccal fat pad removal or any other facial plastic and reconstructive procedure. That way, Dr. Azizzadeh can understand a patient’s underlying facial issues and determine if one or more facial plastic and reconstructive procedures can help address these problems. Dr. Azizzadeh offers free consultations to those who are considering buccal fat pad removal. To find out more about cheek fat removal, please contact us today at 310-657-2203 to schedule a consultation with Dr. Azizzadeh.